Rep. Park Young-sun’s role within the main opposition New Politics Alliance for Democracy is growing in the vacuum left by its moderate leaders. In the wake of NPAD co-chairmen Reps. Ahn Cheol-soo and Kim Han-gil’s resignations, Park was made the party’s acting chair. She will also head the NPAD’s emergency committee. With the majority of the lawmakers in agreement, the committee will be tasked with reforming the party until new leadership is elected early next year. Park, a three-term lawmaker who began her career as a journalist for the broadcaster MBC, entered politics in 2004 as a proportional representative for the defunct Uri Party. Since then, she has made a name for herself as a hard-liner who played prominent roles in pressuring the ruling party and the government, including as the chair of the NPAD predecessor’s committee, for uncovering scandals linked to the Lee Myung-bak government. Despite her strong image and tough reputation, the coming months are likely to be strewn with obstacles for Park. The NPAD has been embroiled in a series of controversies from the outset. The party backtracked on the promise of abolishing candidate nominations for local elections ― a key part of Ahn’s “new politics.” The party was then plagued by allegations of irregularities in nominating candidates for the July 30 by-elections, which ended in a crushing defeat for the main opposition. In addition, the three-term lawmaker has already come under fire from critics who say that she is unsuited for the job at hand. “If the committee’s role is addressing the past, then there is no hope if people like Park head the emergency committee,” Seoul National University professor emeritus Han Sang-jin said in a radio interview on Monday. Last year Han served as the chief of the defunct Democratic Party’s committee for analyzing the party’s actions in the 2012 presidential election. Aside from supposed shortcomings in herself, Park’s term at the main opposition’s helm will likely see renewed jostling among factions. 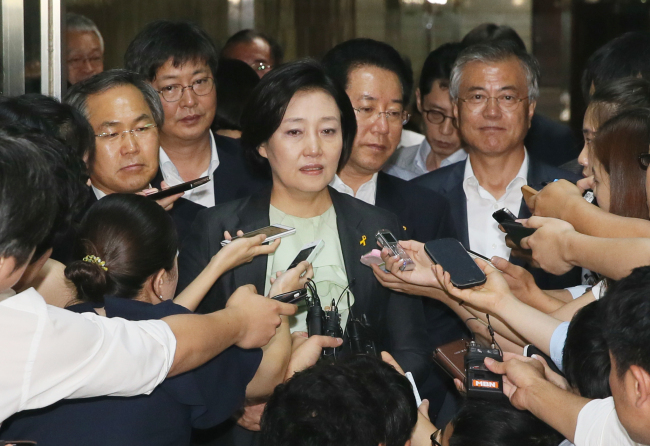 While Park is not herself associated with a faction within the NPAD, some pundits say that the pro-Roh Moo-hyun faction is likely to make a comeback. The pro-Roh faction once held sway in the party, but was pushed to the backburner following the defeat of Rep. Moon Jae-in ― a key pro-Roh figure ― in the 2012 presidential election.